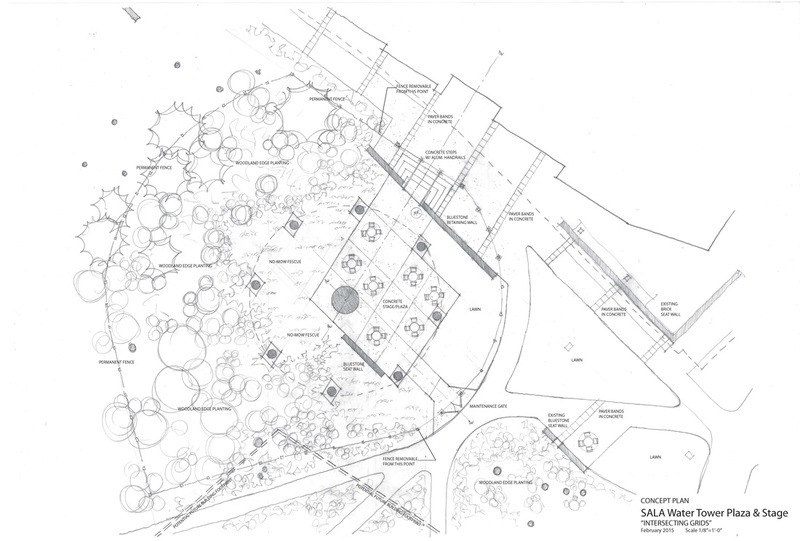 The challenge of this design has been to create a plaza and stage that occupies the space beneath a new 140 foot tall water tower within the arts district of campus. The location is at the edge of Hort Woods and next to the Stuckeman Building housing the School of Architecture and Landscape Architecture--two very sensitive neighbors. 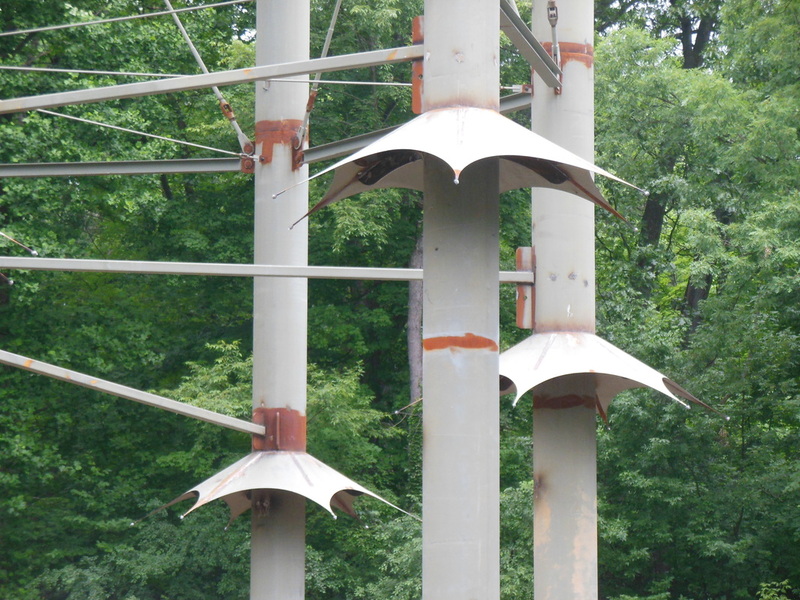 Umbrella-shaped climbing baffles on the legs and an undulating, web-like canopy will help separate the unique event space from the tower looming above. The baffles will contain theatrical lighting and the canopy will act as an acoustic shell, as well as shield the stage from dripping condensation. 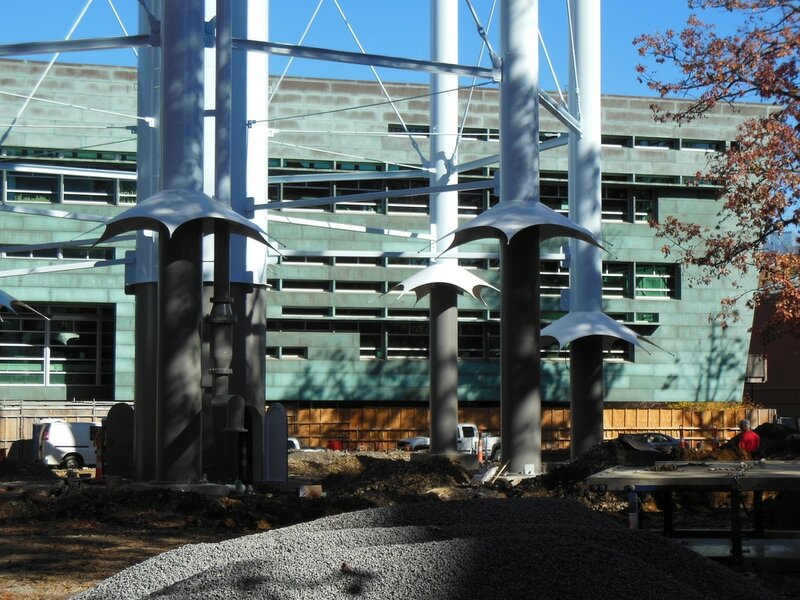 While these features are very much of the tower, the ground plane is an extension of the geometry and landscape vocabulary of Stuckeman that celebrates the coming together of two campus grids. The parallelogram shapes in the pavement and the repetition of parallel stone walls create a foil to the tower and its web-like accoutrements. Careful consultation and collaboration with the tower fabricators was needed. Here's the plan showing the geometry of intersecting grids and parallel walls. This new tower replaces the original that was erected in the 1920s. 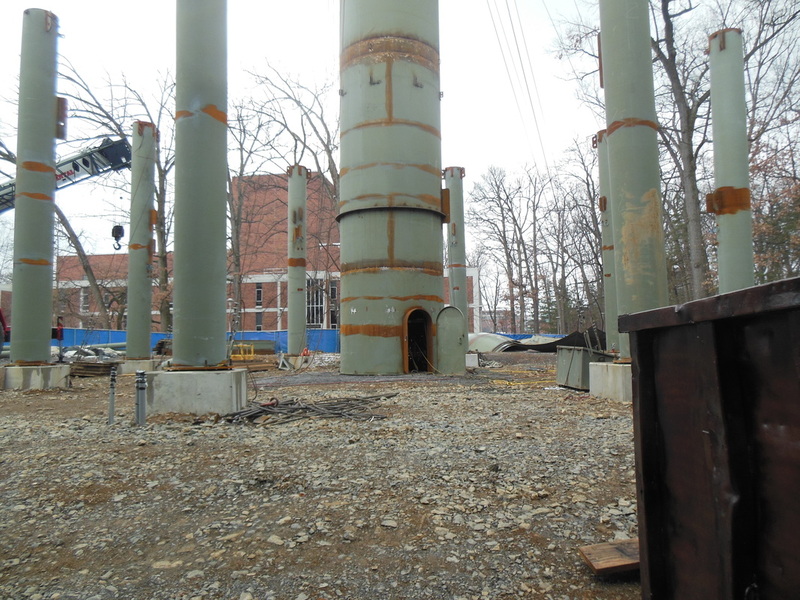 In early spring, the concrete footings for the center riser and tower legs were poured and all underground water pipes and other utilities were installed. 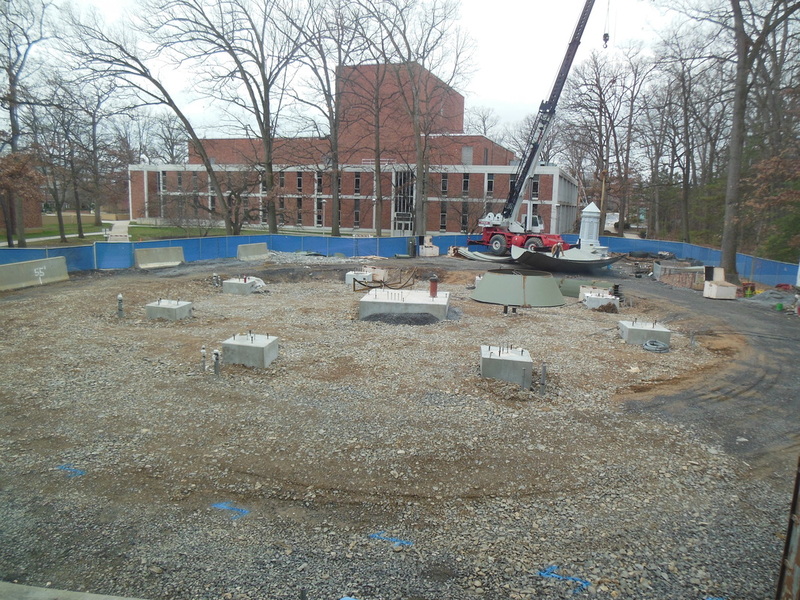 This view is from the second floor of Stuckeman Building looking west. 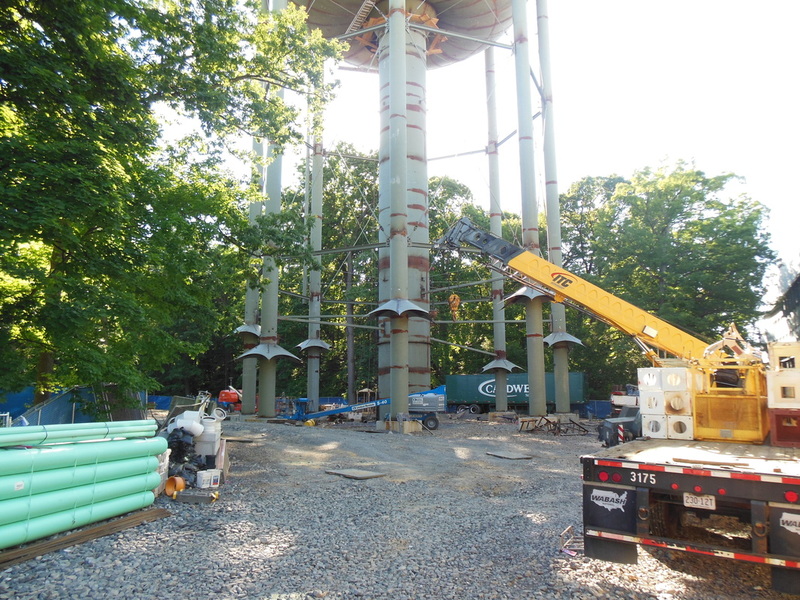 Soon the tower was going vertical among the trees of Hort Woods. This view is taken as you approach from Stuckeman main entrance. Eventually there will be stone steps leading up to the stage from the lower plaza in the foreground. 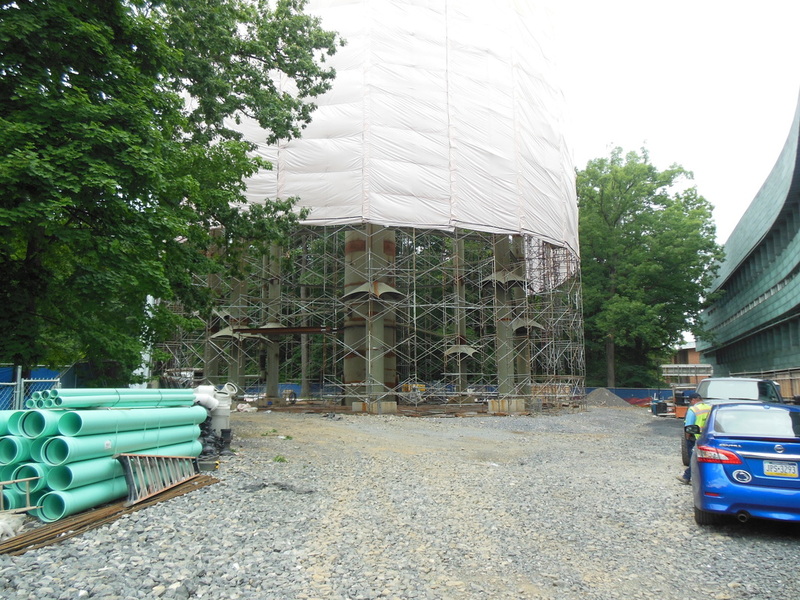 As buds break, the budding tower reaches it's full height and becomes a part of the campus skyline. This zoomed view is from the cafe at Katz Building near the Arboretum. 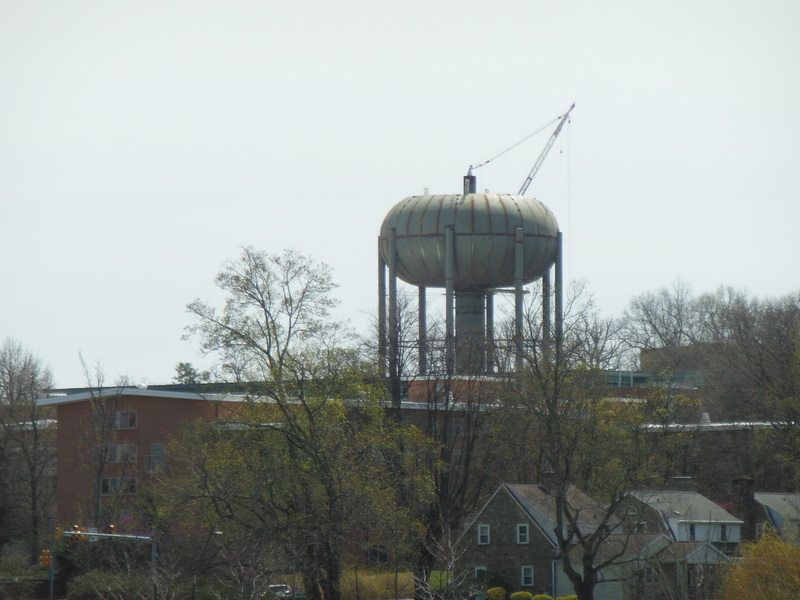 This is the first sign that something a little out of the ordinary is happening to this tower. 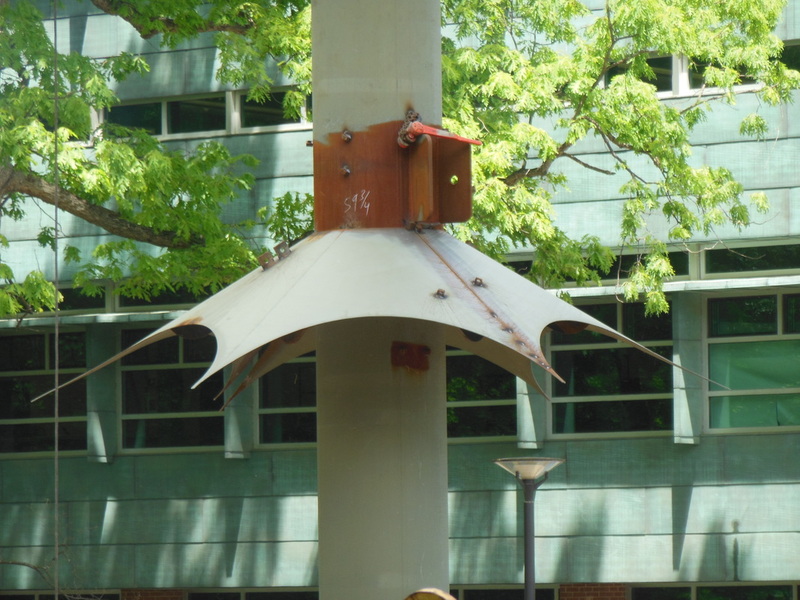 The anti-climb devices have been installed which are conceptually based on squirrel baffles that are used on bird feeder poles. 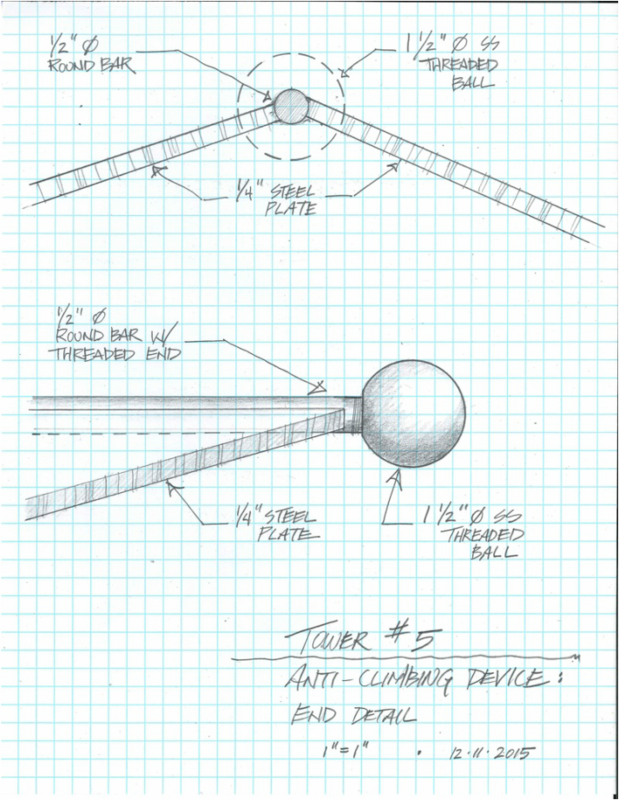 The bracket just above this "human baffle" is an anchor for a canopy that will be stretched above the stage with steel cables like a web interconnecting 5 of the 8 legs radiating from a mounting ring on the center riser. The detail on the right shows a stainless steel sphere that has been attached to the umbrella-like points of the climbing baffles as a way to soften the sharp ends and add a little sparkle in the sunlight. Below you can see a zoomed in shot from outside the fence with the spheres in place. Has Christo come to campus? 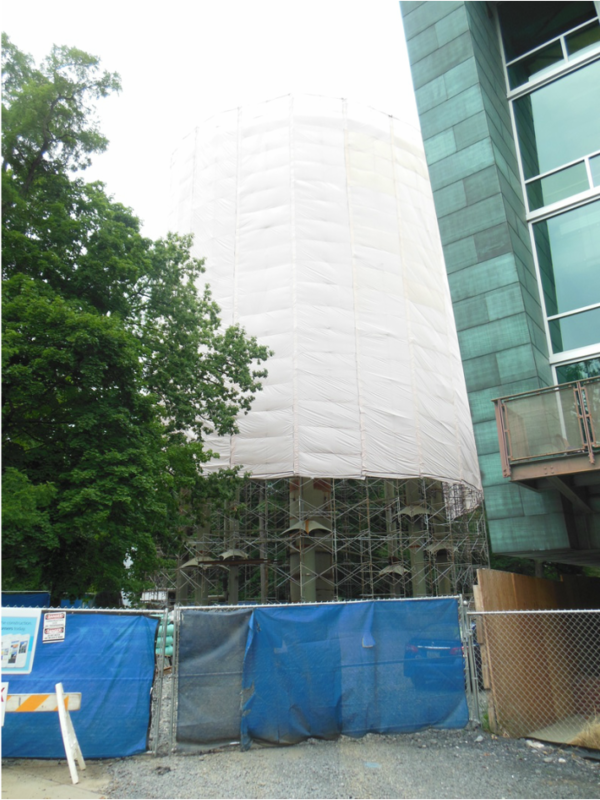 It's July 29th and what appears to be a 140 foot tall shower curtain is, well, kind of like a shower curtain because the painting of the tower is about to begin. The curtain is mounted to scaffolding and keeps the paint from drifting. Here's a more unobstructed view through the fence with our beloved baffles still exposed. So the tower is to be painted a sky blue from the top down to the baffles. 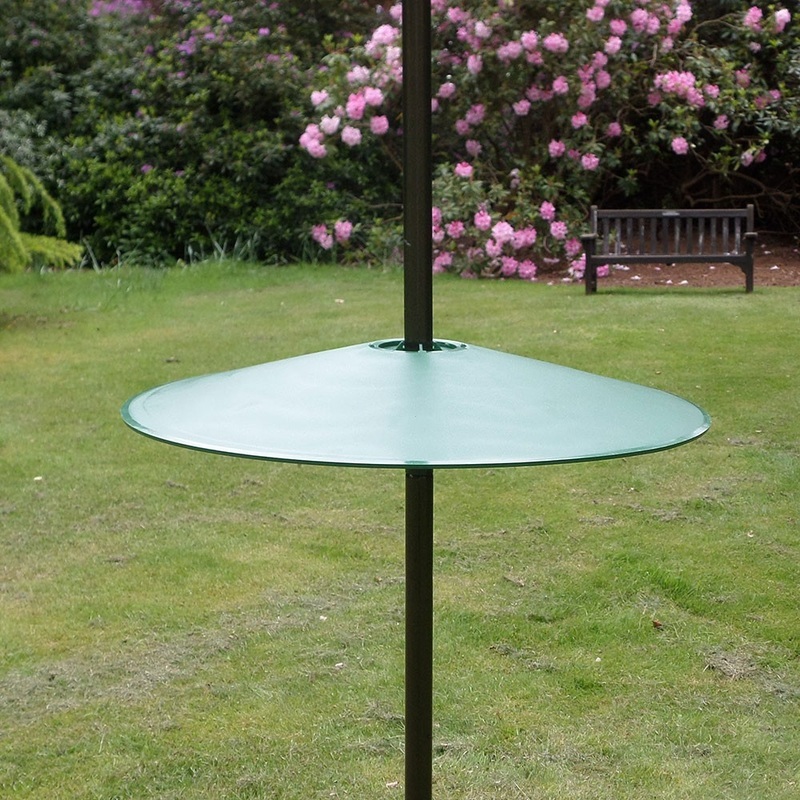 The baffles will be white and will match the interconnecting canopy. 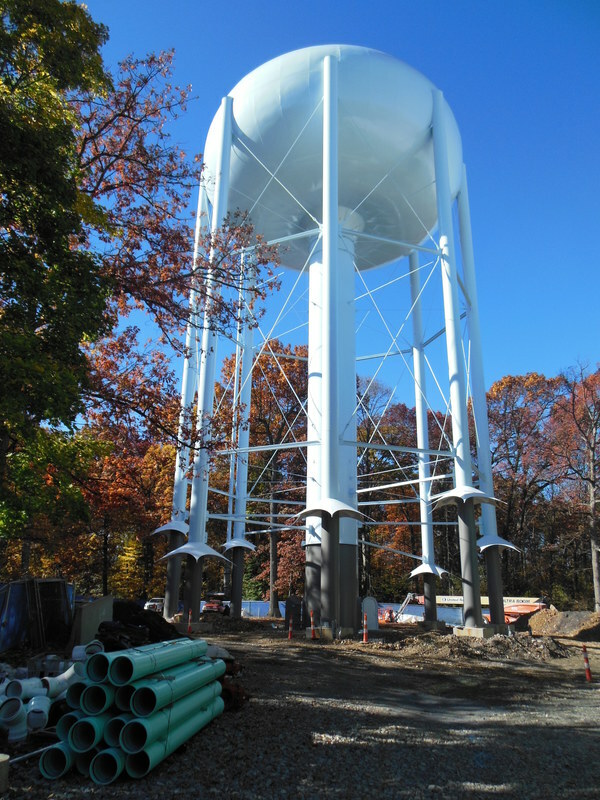 Below the baffles will be a taupe color that is to match the taupe color of the white oak trunks of Hort Woods which surrounds the site. I'm pretty pleased with the paint colors. You can see that the color of the leg bases are not too far off from the oak tree trunk in the background. The baffles have not been painted white yet in these photos and they now stand out more from the light blue of the rest of the tower. And I'm really happy about the stainless steel spheres at the ends of each point on the baffles. It adds some sparkle to all of the metalwork and I thought it was a kinder way to terminate those sharp looking points. So next steps are to begin building the stone walls & steps, pouring the concrete pavement, and installing the fencing and lighting. We should be ready to start as soon as the weather breaks in the spring. I'm sure everyone in this part of campus will be glad to see things take shape and the site cleaned up and usable once more. I know I will.